When I plan parties, I like to have everything coordinate, but I also don’t want to spend a ton of money. 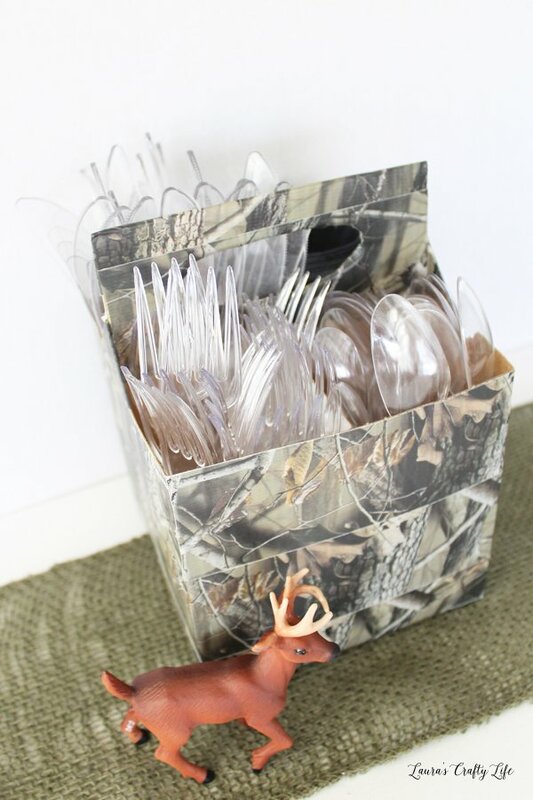 One place I have been able to save is creating a custom utensil caddy that matches the theme of my party. Today, I am going to show you how easy it is to make one of these for your next party or get together. There are so many colors and patterns of Duck Tape to choose from, it is easy to match your caddy to any party decor. The example I am going to show you was for my husband’s camouflage party. 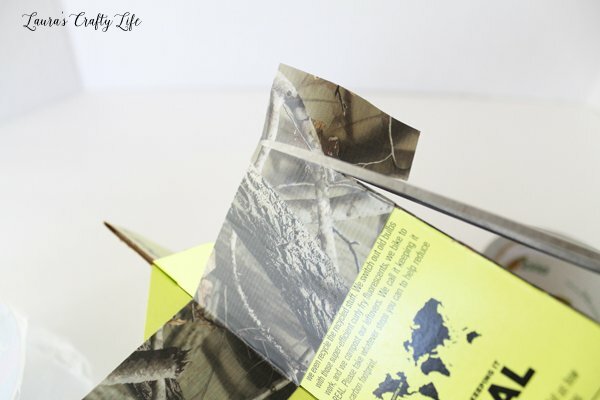 This project is relatively simple, but I have a few tips and tricks for you on how to easily cover your carrier with the tape. 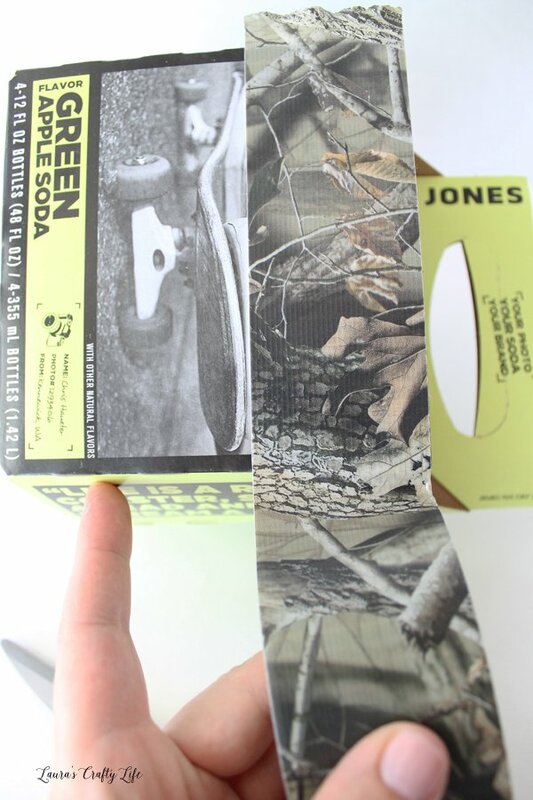 You can use any kind of cardboard drink carrier. We don’t always buy glass bottle drinks that come in these carriers, so when I do, I save them for these types of projects. I always have 2 or 3 on hand. 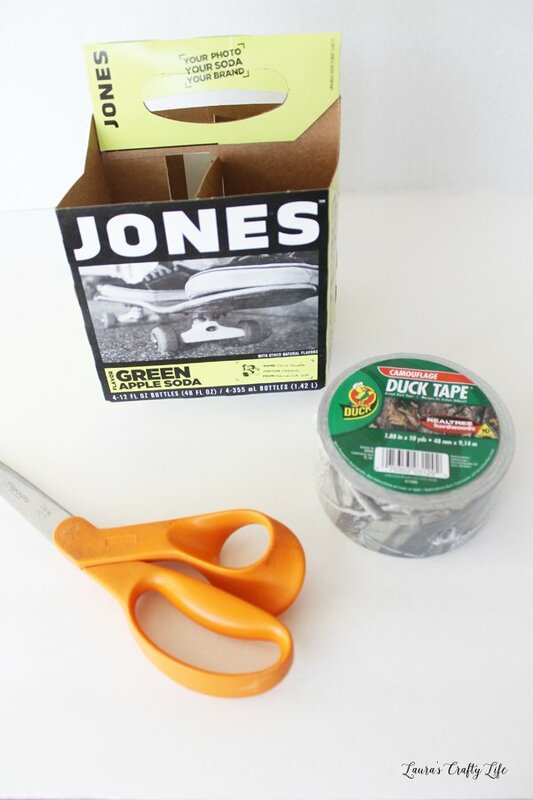 Start at the top of your cardboard container and start wrapping the Duck Tape around the box. Leave a little overhang at the edge of the box so you can wrap it securely. When you reach the end, cut the tape with scissors. 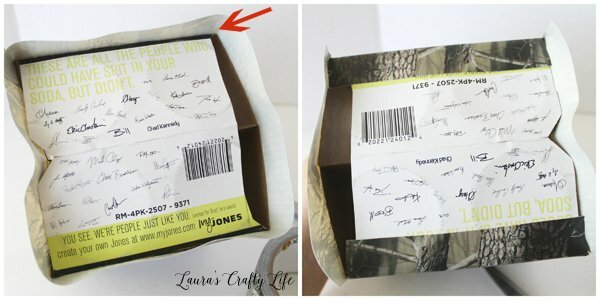 Continue wrapping tape around the box until you reach the bottom. You will often have some excess when you wrap your bottom layer of tape around the box. Simply snip each of the four corners with your scissors. Then, smooth your Duck Tape over the bottom on two opposite sides. Repeat this process with the remaining sides, so your tape is fully secure on the bottom. This also helps to create some stability to your carrier. Wrapping the handle can be a little tricky. 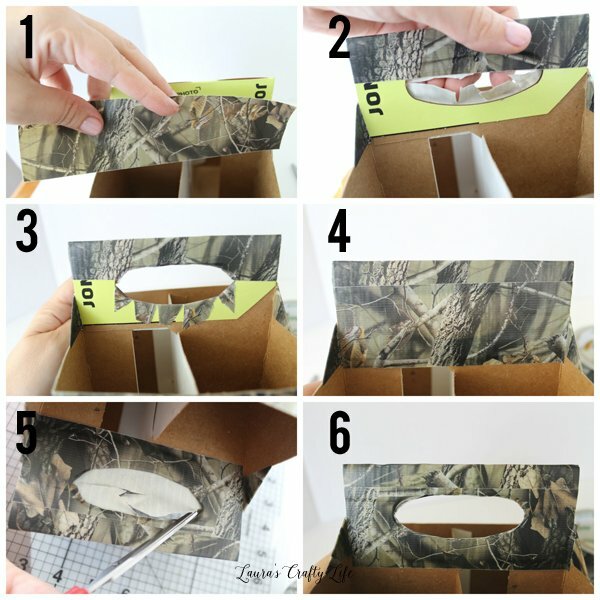 Each beverage carrier will be a little different, but these tips can help you with any style of box. Start by wrapping any excess cardboard on the ends with tape. Next, you will work on wrapping the handle. Using sharp scissors, cut little slits in the hole of the handle. Push the cut tape through to the back side and press firmly to the cardboard. Cover the back side of the handle with more tape. This time completely trim the excess tape from the middle of the handle opening. 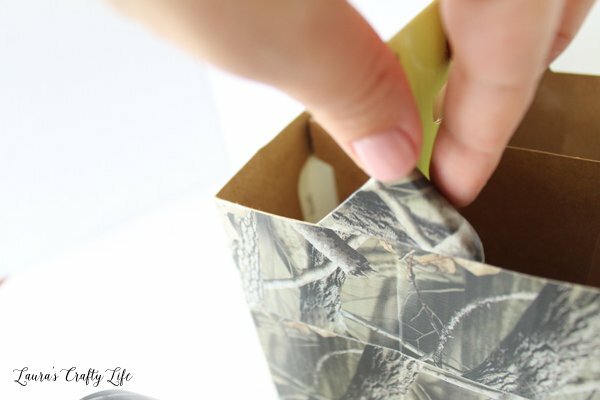 Smooth out any loose pieces of tape and your handle should be completely covered on both sides. 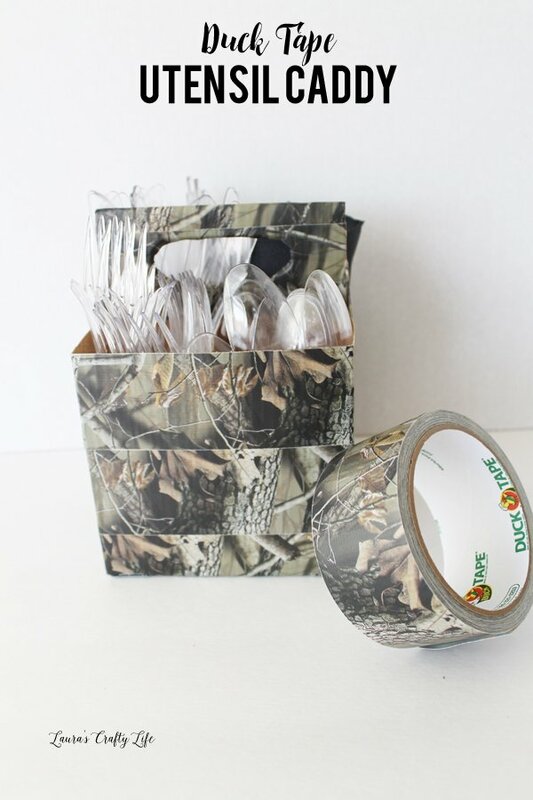 The great thing about the camouflage Duck Tape is that it is very forgiving with the pattern. If you have a geometric patterned tape, this project will take you a little longer to match up the design on each layer of tape. I fill the caddy with plastic forks, knives and spoons. In any extra openings, I roll up napkins and place them in the caddy as well. This is helfpul if you are having a party outside so your napkins don’t blow away. Since this project is inexpensive to make, I don’t feel bad if I need to throw it out at the end of the party. My husband is a hunter, though, and we do a lot of hunting themed events, so I held on to this one. I also created a wood grain covered carrier that matches almost any decor.